One of the most active groups within fundraising is the large number of children who actively give their time to a variety of fundraising causes. Many will fundraise primarily for a school event or a friend, but whatever the circumstances, there are many safety measures that should be followed to ensure that you keep any children involved in your fundraising safe at all times. One of the easiest ways of keeping kids safe when involved with fundraising is to always know the legalities of what you're doing. If you stay on the right side of the law, people won't have any claims against you. Ensure that the kids you have involved are responsible and trustworthy. They should be fully aware of the reasons they're collecting funds and try to instil in them a sense of responsibility and pride as to what they're doing. It's often easier to get kids to take fundraising more seriously when they can see the outcome or imagine the outcome of their labour. Outline all the rules you expect them to follow whilst they're fundraising and make sure they all understand them. Setting this up at the beginning will hopefully keep them on the right track. Obviously when it comes to fundraising, everyone needs to stay safe and sensible, but when kids are involved, it's even more important to have strict guidelines to follow. Perhaps the most important to stress is that at NO point should any child sell alone. It doesn't matter whether they are on a stall, door to door or elsewhere, don't let children sell items alone to raise funds. When it comes to door to door selling, always make sure there's a responsible adult around at all times. 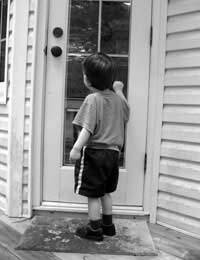 No child should be knocking on the doors of strangers, even if they are doing so for a good cause. Sadly, the world we live in at the moment doesn't allow for this kind of participation from children. In fact, in more general terms, children really shouldn't be speaking to any strangers that they've had to actively approach in an unknown location. It goes without saying that they shouldn't enter anyone's home, even if they believe they know the individual well enough. If children who take part in your fundraising campaign are selling products or perhaps even raffle tickets, it's likely they'll be collecting cash. Always be the responsible adult here and take the cash from them on a regular basis. No fundraiser, whether an adult or a child, should be walking around with a large amount of money as it's really just an open invitation to crime. Planning exactly where you're intending to sell your fundraising items, or where you intend to carry out fundraising activities can also be crucial to keeping children safe. Never sell on street corners, or near stop lights. It's all too easy for cars driving past to slow down and see a vulnerable child there as a target. As always, if you are selling in a public area, you should ensure you've obtained the correct permits to do so. It is crucial to follow all of the advice contained above when fundraising with children, but there are some very simply common sense approaches that can be taken to enhance the safety aspects mentioned above even further. Try and get as many parents and guardians involved in the fundraising as possible. They have an inbuilt 'child radar' that means they know where their kid is at all times and are more likely to focus on their safety. Also get approval from parents for the kids activities, this keeps you correct legally as well as ensuring the children's parents know exactly what they're doing. Never be tempted into fundraising after dark or in unfamiliar environments. It's always better to fundraise during the day and in a location that you know well and that the child knows well. Perhaps even getting children to sell to relatives and friends is a safer alternative to sending them out to sell to complete strangers. If you do find anything strange or encounter any situations that you perceive to be dangerous, remove yourself and any children from them immediately and call the police.